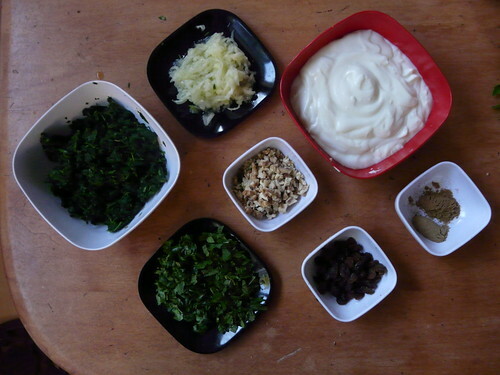 Raita is a standard side dish designed to offset the spiciness of many Indian dishes. It can be made with fruit or vegetables, but the base is always yogurt. It’s like a savory version of the whipped topping & marshmallow “salads” you find in American church basement dinners – it’s creamy and light, but not sweet or sticky. Cucumber raita is very common, but I am not fond of the way the cucumbers’ juiciness leaks into the yogurt without bringing much flavor or color, so I like this recipe much better. The cooked spinach in this recipe helps bind all the ingredients together and the nuts and raisins provide a nice variety of flavors and textures. If you feel like it, you can add chili powder too. I like it as a counterpoint to spicy dishes, so I don’t. 1/3 cup chopped nuts – walnuts, cashews, almonds, etc. 1/4 cup chopped herbs – mint and cilantro, preferably. Combine dressing ingredients in a bowl, then stir in salad ingredients. Sprinkle with paprika. Note: To thaw the spinach, you may need to microwave it and then squeeze out the juice in a mesh drainer or by hand. 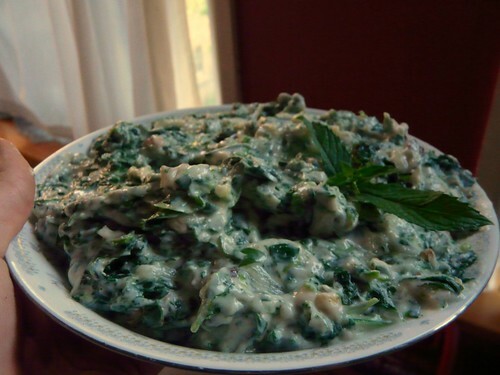 If the spinach isn’t well drained, the salad will be more watery than creamy.